Established in 1976, Corona Coatings Corp. is San Bernardino's premier choice for high quality spray foam roofing, wall insulation, tank coating, and foam roof maintenance, inspection and certification services. For over 35 years, Corona Coatings Corp. has provided the most innovative spray foam insulation (SPF) technology for thousands of satisfied residential and commercial clients throughout our Inland Empire service area. For years, building industry professionals have acknowledged the benefits of spray foam roofing and insulation technology. Spray foam roofing and insulation products are highly efficient, providing significant energy savings over traditional fiberglass batt and blown-in cellulose insulation. Moreover, spray foam insulation is the preferred choice for property owners who want to provide the most temperate environment possible within the walls of their homes or businesses, and provide the best living conditions possible for those inside. At Corona Coatings, we are an authorized contractor for both the Henry Company and NFCI Polyurethanes, and proudly install their high performance spray foam roofing and insulation products. Our spray foam roofing and insulation technicians each have 12 to 14 years of experience working in the industry, and must participate in an on-going program of training in our products. Our skilled technicians are committed to observing the highest standards of professionalism on the jobsite, and with always providing our valued San Bernardino clients with excellent customer service throughout the duration of their spray foam installation projects. Call the professionals at Corona Coatings Corp. today. We provide free onsite estimates. Find out how our energy efficient spray foam roofing and insulation products can improve the environment of your San Bernardino home or business, and also provide relief to your energy budget. Corona Coatings Corp. is licensed, bonded, and insured. At Corona Coatings, we install spray foam wall insulation in San Bernardino new and existing construction. The decision to install polyurethane foam wall insulation in your home or business is a wise investment in your building's value and functionality. Spray polyurethane foam's thermal properties are far superior to those of blown-in cellulose insulation or fiberglass batt insulation. In addition, unlike fiberglass batt and cellulose insulation, spray polyurethane foam wall insulation has the ability to conform tightly to every angle and structure within the wall cavity, eliminating gaps around electrical outlets and conduits, and forming a tight seal around pipes and other through-the-wall plumbing penetrations. In addition, whenever new work is performed to an insulated wall , such as ductwork or window installation, spray foam insulation can be easily applied to fill in the gaps this work has created within the wall cavity, seamlessly incorporating the new structure(s) into the insulation system. 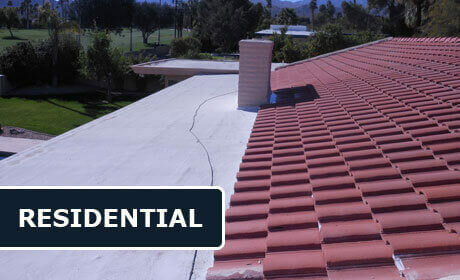 For over 35 years, San Bernardino homeowners, business owners, and construction industry professionals have relied upon the experienced professionals at Corona Coatings Corp. to expertly install spray polyurethane foam roofing and insulation at their homes, businesses, and in their new construction and remodelling projects. Insulation is an extremely important aspect of every structure's design, because it has a major impact on the comfort of those who live or work inside. Spray polyurethane foam roofing and wall insulation systems provide superior thermal performance over traditional insulation systems, because they possess a higher R-value per inch of thickness. Moreover, unlike conventional fiberglass and cellulose insulation, which is characterized by gaps in coverage, spray polyurethane foam roofing and wall insulation forms a seamless envelope around a building for the most effective thermal barrier possible, providing a superior barrier against both hot and cold outdoor conditions, and significantly reducing the output of energy required to heat and to cool San Bernardino residential and commercial structures. 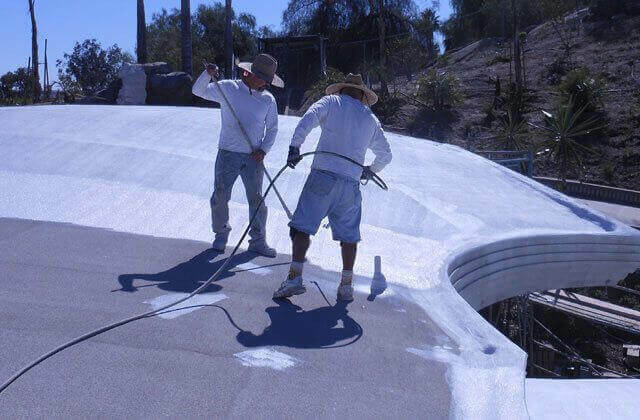 At Corona Coatings Corp., our skilled roofing technicians can typically apply our spray foam polyurethane roofing system directly over an existing San Bernardino roof, precluding the need for a costly, disruptive tear-off of the old roofing system. And while the seamless nature of foam roofing systems makes them highly resistant to damage, if mechanical damage to the foam membrane ever does occur, the required repairs can usually be performed with only a caulking gun and sealant. Moreover, with proper maintenance, the average life expectancy of a spray polyurethane foam roof is 12 to 14 years, after which time, the existing foam roof can easily be recoated, and granted a whole new lifespan. 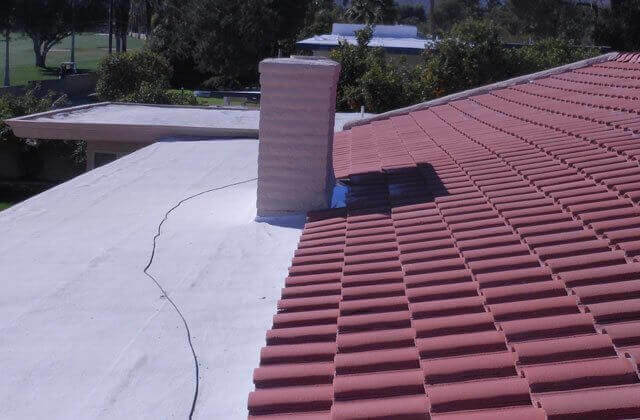 Corona Coatings Corp. also provides San Bernardino with free foam roof inspection services for all types of existing foam roofs. During our inspection, our foam roofing professionals will carefully evaluate the integrity of your home or business polyurethane foam roofing system, check for leaks, and provide a written proposal recommending maintenance and repair services as needed, always keeping the long-term health and functionality of your foam roofing system in mind. At Corona Coatings Corp., we appreciate the importance of choosing the right contractor to provide the insulation for your San Bernardino business's commercial storage tank, and perform all or our storage tank insulation projects to exacting standards. Our spray foam insulation is ideal for insulating water tanks, grease traps, chemical tanks, and solar tanks, and we have the capability of insulating both heated and cold storage tanks, enabling these containment devices to maintain the optimal temperature required for storage, maximizing their energy efficiency and saving our clients money on their utility bills. At Corona Coatings Corp., we have provided our tank insulation services to businesses throughout the Inland Empire, and have even performed our tank insulation services for local wineries. In addition, because foam insulation adds inches to the diameter of storage tanks, our technicians always replace our clients' storage tank fittings as necessary following foam insulation application, in order to accommodate the increased dimensions of their storage tanks. 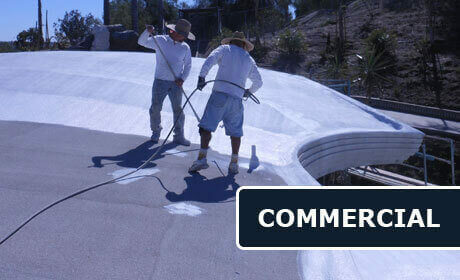 Corona Coatings Corp. also provides San Bernardino with official spray foam roof certifications. When a home or commercial building with a spray foam roof is sold, a thorough inspection and official certification performed by a licensed professional is required by law. At Corona Coatings Corp., we have decades of experience assisting residential and commercial property owners and real estate agents at meeting this requirement, and in only recommending the most cost-effective repairs and maintenance services necessary to help our clients meet certification standards. Call us today. We offer free onsite estimates to all of San Bernardino. Our office hours are Monday through Friday, 8:00 AM to 5:00 PM, and we accept all major credit cards.